I love Halloween, but I’m a little sad this year because our new house is out in the country where few Trick-or-Treaters go. Instead, I’ve been spending my time baking and creating fun Halloween treats for the kids to take into school. I’m certain they don’t mind, and their teachers are more than happy to take them off my hands. 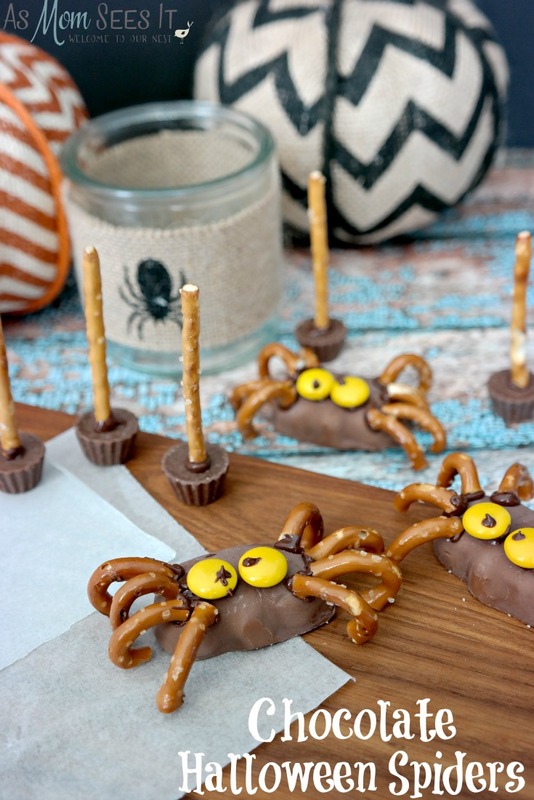 Included are these adorable peanut butter and chocolate spiders that I made! I love them, and their part of a Halloween collection of recipes that are featured on the Hershey’s website. We wanted to share them with our readers, so we’re happy to be working with Hershey’s and Rite Aid – where we were able to find all of the ingredients – on this sponsored post to show you how fun and easy these are! Line a tray or cookie sheet with wax paper for easy removal. Remove wrappers from 8 REECE’S Peanut Butter Pumpkins. For each spider, break or cut 8 curved sections from pretzels which will form the legs. Set aside remaining pretzels pieces. Place milk chocolate chips in small microwave-safe bowl. Microwave at 50%/medium power for 30 seconds; stir. If necessary, microwave for an additional 10 seconds at a time, stirring after each heating, until chips are melted and smooth when stirred. Transfer to small heavy duty plastic food storage bag. Cut off one corner of bag about 1/4 inch from the tip. For each spider, place REECE’S Peanut Butter Pumpkin on wax paper. 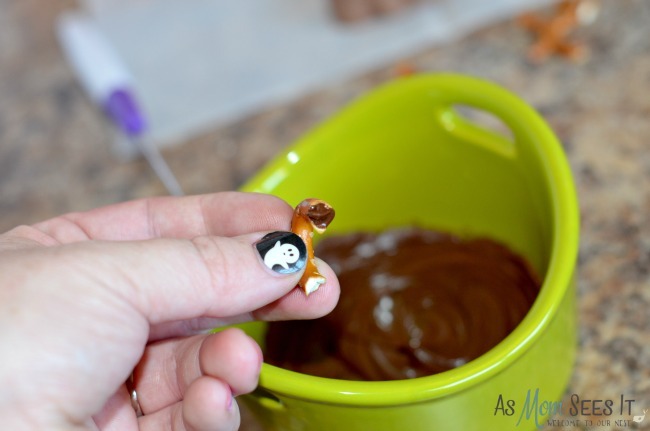 Attach pretzel legs using the melted chocolate. 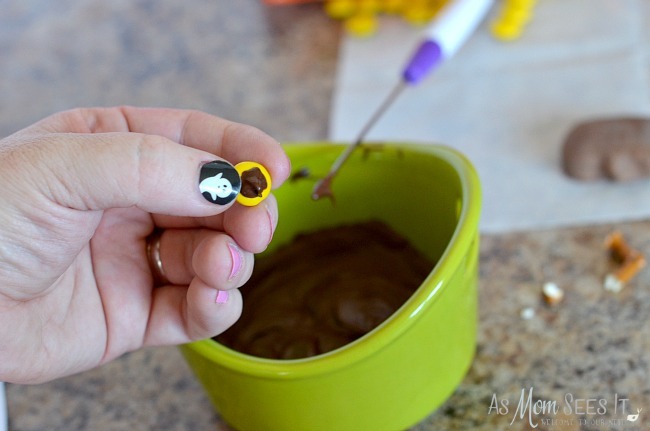 Attach white or yellow candy to spider with melted chocolate; place dot of melted chocolate on each eye. Allow chocolate to set before moving spiders. Remove wrappers from Peanut Butter Pumpkins. For each spider, cut 8 curved sections from pretzels which will form the legs. Set aside remaining pretzels pieces. Place milk chocolate chips in small microwave-safe bowl. Microwave at MEDIUM (50%) 30 seconds; stir. 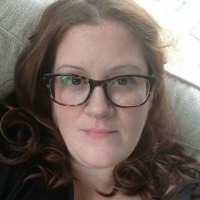 If necessary, microwave at MEDIUM an additional 10 seconds at a time,stirring after each heating, until chips are melted and smooth when stirred. Transfer to small heavy duty plastic food storage bag. Cut off one corner of bag about 1/4 inch from the tip. For each spider, place peanut butter pumpkin on prepared tray. 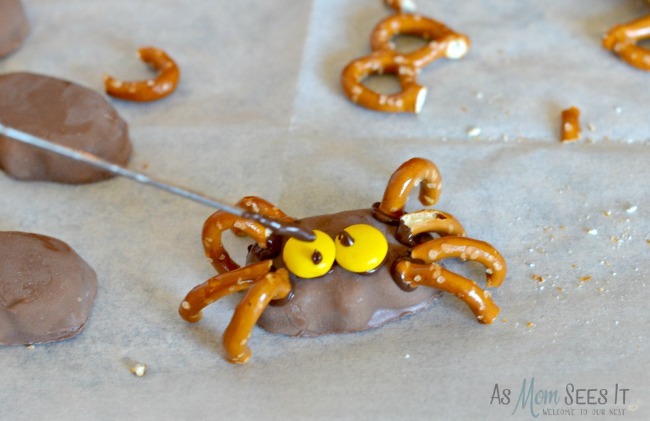 Attach pretzel legs and white or yellow candy to spider with melted chocolate; place dot of melted chocolate on each eye.